We choose dazzling car accessories to transform the look of our trucks or SUVs but give little attention to the safety and convenience factor. Pickup trucks and other such vehicles are tall and have larger tires due to which a lot of people may have a tough time in climbing up into the truck. Overweight people might not be able to lift themselves up due to the increased body weight or abnormal body size, and short individuals may have to struggle a lot. If you have been facing a similar issue then it’s high time to go for a new modification in your truck and opt for a running board. 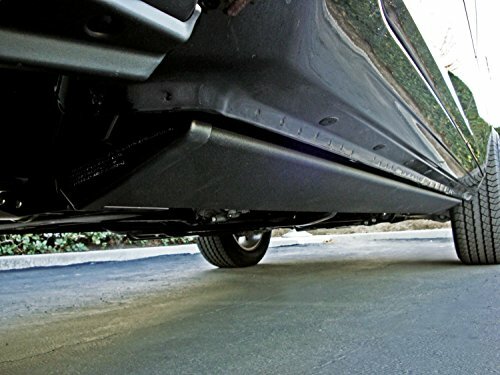 Running boards save you from the hassle of entering and exiting the vehicle by providing support as a ledge. 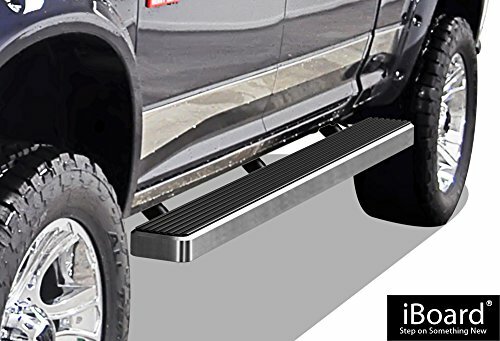 If we think about it, it can be a bit embarrassing when someone has to struggle to get into a truck or SUV, therefore, side steps are an important asset that can provide ease when it comes to getting in and out of the vehicle. You need this even if you have no trouble in getting on or off your truck. This is because others around you might not be tall or fit enough to do so. Imagine a scenario when you want to make a grand entrance before your friends or family, but the stretching, grabbing and reaching struggle play the spoilsport. That would ruin all the fun. So, if you hate it when you become the subject of a good laugh just because you had a hard time climbing onto your pickup truck then it’s time to get suitable running boards for your vehicle. Before we get into the details, let us first get to know what makes a running bar a good one and what should you consider before your purchase. Truck Side Steps come in a variety of colors but let’s just not make them all about aesthetics. They have a fine job to pull and that is to make it easier for you to climb in and out of the vehicle. Therefore, other than the looks, we also need to know about the material it is made up of and other such factors that are important. Moreover, this guide will help you to make up your mind about which brand as well model mostly suit your vehicle. If you can’t wait, here is a quick list for you. Nerf bar serves as a step-on to make it easy for people to enter and exit a higher vehicle. There are two popular types of nerf bars being used till today, full length and wheel-to-wheel design. They not only enhance the look of your vehicle but also serve as a great step ladder as well. They are available in different sizes and shapes, and the right one depends mainly on the height of your vehicle. Running boards are flat and four inches or wider in breadth. These run along the length of a vehicle and have the same functionality as the nerf bar, to serve as a step-on. Both nerf bars and running boards can be found in diverse design and shapes and made by a variety of materials such as aluminum, fiberglass, steel or composite plastic. Running boards are almost the same as nerf bars, however, these are attached 3 inches below the pinch weld which acts as a foot support to enter and exit the vehicle. The reason that nerf bars are so popular is because they come in a variety of types. Round Bars: Round bars are known for having a wider stepping area since they are large in diameter. They are suitable for vehicle owners who have multiple entries and exit points in their vehicles as it allows you to step in or out from any location as the bar runs all the way from the front to the rear end. Since it has a round shape, most of its parts are coated to increase traction so that the entire bar has a solid grip. Note that if your goal of installing a nerf bar is to increase convenience than go for round bars that are the largest in diameter because the larger the diameter, the larger will be the stepping area. Ovals: If the stepping area of a round bar seems smaller to you then you need to consider oval nerf bars since they have larger diameters than round bars. 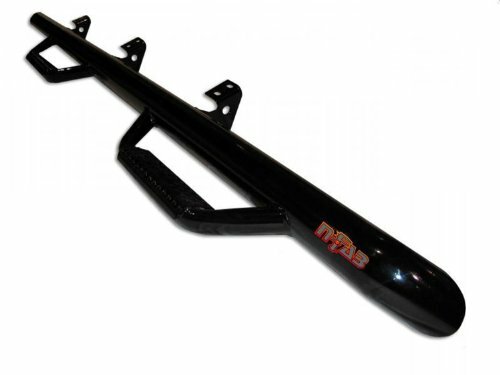 These nerf bars give a stylish look to your pickup with their curved, straight or bent ends. They come in a variety of colors with different coats to enhance their grip. Hoop Steps: This type of nerf bar hangs a bit farther than other bars. They are not full length bars but are individual steps that are installed on specific locations only, usually below the doors. If for some reason, you don’t like to have a nerf bar run along the entire length of the vehicle then hoop step nerf bars are better for you. Mostly, you don’t want many accessories to be visible on their vehicle opt for this type of nerf bar. Commonly, there are two kinds of hoop steps. One comes as an individual style rung while the other is a combination of three style rungs. Choose the style that compliments your vehicle. It’s not necessary to have a full length bar installed on your car, you can opt for hoop bars as they are not visible and serve as a good stepping accessory. Cab Length: This one runs along the length of the cab and is installed under every door of the vehicle. If you have a two door truck then one stepping location will be installed on each side. However, for a larger truck with four doors, go for two stepping location on each side. Wheel to Wheel: They’re the longest type of steps that not only give you easier access in and out of the car but also to your cargo or truck tool box as well. Unlike other nerf bars, this one goes beyond normal length and runs along the side of the bed, permitting access to vehicle’s cargo, too. If you happen to have a work truck or a loading truck then wheel to wheel nerf bars are a good choice as they provide twin functionalities. Individual Steps: As the name suggests, they are single step-ones that are installed under each door. Despite being 10-20 inches long, they are not suitable for all vehicles. They are cheaper than full length running bars but there’s a problem. You can’t mount them using bolts only, unlike other bars. One must drill into the vehicle to make mounting space on the truck’s body frame. 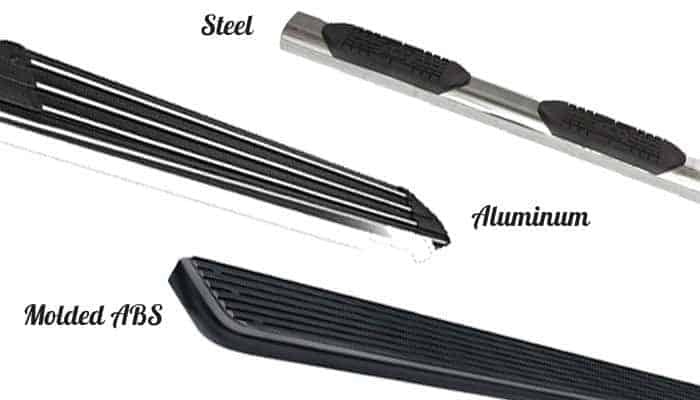 Now that we know which factors to look for when picking a running board for your vehicle, it is time to have a look at some of the best running boards on the market. One of the best running boards one can find on the market is the APS iBoard. It has a sleek design that compliments your truck and serves the purpose of a running board like it’s supposed to. Aluminium Finish: This iBoard has an aluminium finish which makes it look amazing on your truck. The best part is that the board is 100% aluminium with no plastic parts attached to it. This makes it extra durable too. Corrosion Proof: It can be frustrating when you spend money on a running board and it gives up to corrosion. This doesn’t happen with APS iBoard because it is corrosion proof. Extra Strong: The main purpose of a running board is to permit passengers to get in and out of the vehicle no matter how high it is. This becomes a bit problematic with overweight people and many running boards even break due to too much weight. Considering that, the APS iBoard is made extra strong and it can easily support 350 pounds of load capacity as it is made up of high-end aircraft material. Wide Stepping Area: The board has a 5” wide stepping area which makes it easier to set foot and climb up or down. Anti-Slip: There’s a rubber step cover wrapped on the board which makes it safe to use the board. The rubber steps avoid slipping and offer a comfortable step to the passengers. Works Fine With: 2009-2018 Ram 1500 Crew Cab Pickup 4Dr & 2010-2018 Ram 2500/3500. DIY Install: You receive two sets of boards, one for each side, along with bolts and a mounting bracket. No drilling required to install it, it fits easily using bolt-installation. The product weighs 48 pounds and is also ISO certified for quality. Therefore, it’s a perfect fit for your truck both in terms of quality and looks. If you have a 2015-2018 Ford F150 SuperCrew Cab Pickup 4-Door / 2017-2018 Ford F-250/F-350 Super Duty then this running board will work like a charm. The aluminium body is slip and corrosion resistant and also offers a firm step when you place your foot on it. Highly Comfortable: Nerf bars can be bulky and very stiff when it comes to climbing on them. This makes it uncomfortable for many people. Coming to APS iBoard Matte Black, it is designed to provide utmost comfort during use because the solid edge to edge step is too smooth. ISO Tested: This product is tested for a number of things such as being resistant to corrosion, breakage, and slips. Plus, it is UV resistant as well. It’s a product of quality and purchasing it for your truck will give you peace of mind for sure. Combination of Light and Strong: It is manufactured with aircraft grade aluminium which is machined, milled, deburned and surface treated to give final touches to the product. And since the product weighs only 46 pounds, it serves as a perfect combo of being lightweight and strong. Width and Load Capacity: The running board is 4” in width, however, they also come in increased width ranging from 4” to 6.5”. It offers a good stepping area and has a load capacity of 300 pounds which is a great feature. It is an amazing running board that transforms the look of your pickup and gives it a different yet stylish look. UNIQUE LOW PROFILE DESIGN- Upgrade your truck's style with iBoard's patented low profile design. Look different with iBoard running boards! If you have been searching for the best truck nerf bars for quite some time now then your search ends here. Tyger is a company that deals in making durable and quality vehicle accessories that are OEM manufactured, meet DOT regulations and also provide 100% user satisfaction. Riser Side Steps: Nerf bars often look bulky and affect the aesthetics of your truck. However, Tyger Auto TG is a beautiful sidebar riser that improves the look of your ride and also serves as a strong stepping accessory. Moreover, the black polish finish on them and the coat of dual-stage gloss black powder uplift the look of your truck. Long Lasting: Many nerf bars give up to external elements such as dirt, debris, and UV rays and begin to discolor soon. 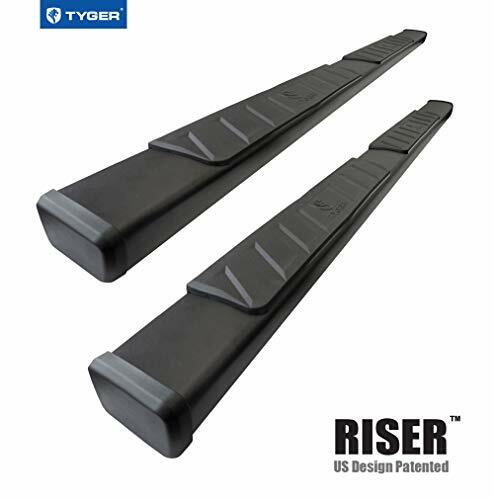 But, this is not the case with Tyger Auto TG riser because it is UV resistant, and offers great protection against slips as well. The tubing is made up of heavy duty steel that doesn’t break easily. Last but not the least, there’s a 5 year warranty on the product in case of manufacturing defects. Fitment: It fits on the 2007-2018 Chevy Silverado 1500 2500 3500HD Extended/Double Cab except for the fit 2007 classic model. It also fits on the 2007-2018 GMC Sierra 1500 2500 3500HD Extended/Double Cab. Easy To Install: The product comes with an installation guide which is very easy to follow. No drilling is involved, all you need to do is fit the bolts and you’re good to go. The Tyger Auto is commendable when it comes to being stylish and enhancing the aesthetics of your truck. Star Armor Design: The nerf bar has a star armor design on it which is embedded using laser cutting technology. Heavy duty tubes of 2 inches are welded on the bars for extra durability. Moreover, there are end caps sealed onto the ends of the bar to protect it from outside damage done by dirt and debris. DIY Install: It only takes 15 minutes on each sides to install the bar and the best part is that you can do it yourself. All you will need is a socket and a ratchet to fit the bar under the door without having to do any drilling. Durable: There’s a dual girder system on the nerf bar which makes it highly durable and capable enough to withstand a lot more weight than most nerf bars. Note: This nerf bar is meant for specific trucks only. It is only compatible with double Cab with 4 full-size doors and doesn’t install on Cab with 2 full-size front doors & 2 suicide rear doors. 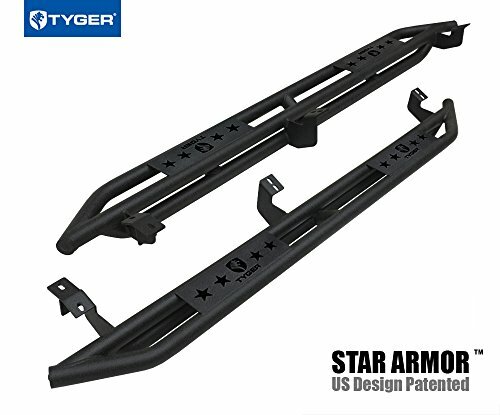 So, if you are frustrated having to struggle every time you try to get into the truck, or if your existing nerf bar can’t bear your weight then it’s time to get Tyger Auto TG Star Armor Kit. TAC Side steps is a combination of both beauty and quality. The oval shaped ends enhance the visual factor while the black finish is durable enough to avoid damage. Rust and Corrosion Free: The side step bar is coated with heavy duty black finish that makes it resistant to rust and corrosion. This means that even in heavy rain, the side step won’t lose its touch or get discolored. Anti-Slippery: Side steps are supposed to prevent falling incidents and eliminate hassles associated with getting into or outside of a truck. However, if the material of the step bar is slippery, it can cause slip and fall accidents. To avoid this from happening, TAC side steps use the anti-slip material on the body of the product to offer a smooth and tight grip. Stylish: The oval ends of this side step bar make it unique and special when installing on a truck. The shiny black texture shines in the daytime and takes your truck up a notch when it comes to the looks. Note: They are only suitable for 2005-2018 Toyota Tacoma Double Cab Truck Pickup and won’t fit properly on other models. 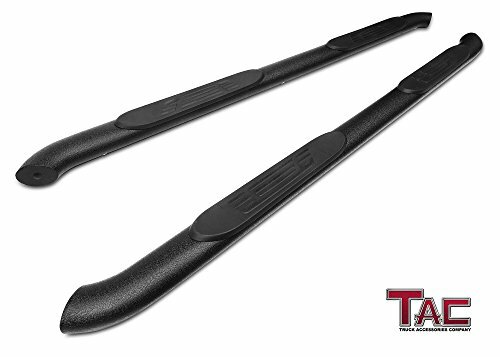 If you are in search of a side step bar/nerf bar that is both stylish and durable then TAC Side Step bar is an amazing choice. SURFACE FINISH- Heavy texture black finish maximizes rust and corrosion protection. OUTSTANDING DESIGN - TAC side steps give your car outstanding appearance and extra protection, make you convenient to get in or out of your car. EASY TO INSTALL - Easy bolt-on installation. No drilling or cutting required. All mounting hardware and Installation instruction included. NO-HASSLE WARRANTY - High quality standard. 3-Year warranty against manufacturing defects! 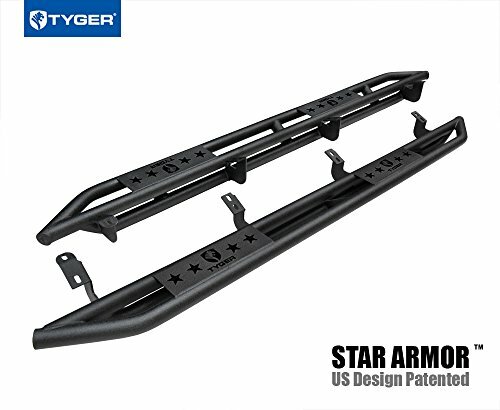 If you are looking for a juggernaut of a running board then Tyger Auto TG from 2007-2018 Jeep Wrangler is one of the best running boards you can get for your ride. It can bear 500 pounds of weight at max, which makes it one of the most reliable and powerful options out there. Durable: The running board is made up of dual girders which give it extra strength to bear more weight. Other than that, it also protects the underside of the running board from unexpected and sudden hits by elements found on the roads. Stylish Star Armor Design: There’s a star embedded design on the running board which is made using cutting laser technology. This design uplifts the visual appeal of your vehicle and makes it look alluring. Other than that, there are welded heavy duty tubes of 2 inches in diameter on the bars to make it extra strong and durable. Last but not the least, the end caps are sealed on the ends of the bar to prevent dirt and debris from getting inside. Quick And Easy Installation: Unlike other running boards, this one doesn’t require a lot of time to install. Installing the bars on either side only take 15 minutes each. The process is simple as it comes with an instruction manual. You will need a socket and a ratchet to install it by fixing the bolts; no drilling is required. Note: This nerf bar is meant for specific trucks only. It is only compatible with 2007-2018 Jeep Wrangler JK 4 Door, excluding the 2018 Wrangler JK models. 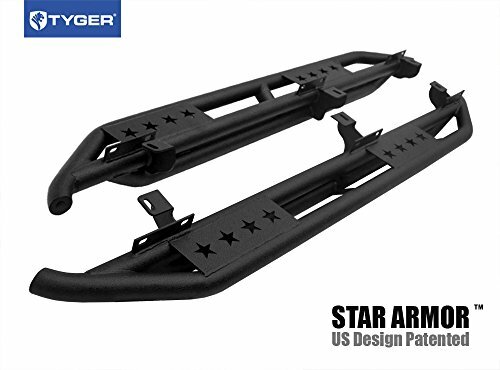 Get Tyger Auto TG Star Armor Kit for 2007-2018 Jeep Wrangler if you don’t want to struggle while climbing your vehicle and also want to take the style factor up a notch. Fits 2007-2018 Jeep Wrangler JK 4 Door (Exclude 2018 Wrangler JL Models). TYGER Dual girder system provides maximum wheel-to-wheel protection for underside and rocker panel area from damaging impacts. Keeps Jeep from catching on rocker panel and hanging up on obstacles. TYGER Limited Lifetime warranty against manufacturing defects! Tyger auto running boards are made with both style and quality in mind. The highlight of this running board is its ability to bear 500 pounds of weight without bending, breaking or squeaking. Other than that, it is also very easy to install. It’s a perfect fit for Toyota Tundra CrewMax (models 2007-2018). Stylish Embedded Star Design: The manufacturers have used laser cutting technology on the board which gives it a sleek star patented look. It’s one of the best features of this running board because it enhances the look of your vehicle to a great deal. The board is a one piece board with no joints in between and has 2 inch heavy duty tubes welded on the bar which increase its overall durability. Dual Girder System: Not a lot of running boards can handle outside damage inflicted by rocks, dirt, and debris that are on the road. This causes several scratches and dents on the vehicle’s door and makes it look unsightly. The solution to the problem lies in installing the Tyger Auto Armor Kit for Toyota Tundra CrewMax as it has a double girder system installed on the underside which protects it from outside damage and safeguards the door. Superior Weight Capacity: What makes this running board a viable option to install on your Toyota Tundra CrewMax is its ability to withstand a weight capacity of 500 pounds. That’s a great plus because mostly, Toyota Tundra Crewmax is used to carry heavy loads. Hence, the running board will aid in loading, and unloading heavy stuff with great ease. If you are looking for both strength and aesthetics then this is the right product for you. This is a wheel to wheel nerf bar known for its amazing weight capacity and durability. It prevents rust from accumulation as there’s a zinc coat finish on the entire body. Moreover, there’s a 5 year warranty on the finish and lifetime warranty on craftsmanship. Multiple Finishes: This nerf bar is manufactured in three different finishes, namely: gloss finish, textured black finish and stainless steel finish. All of the three are extremely durable and stylish. Various Length Options: It comes with three running lengths too including wheel to wheel, cab length, and bed access. The wheel to wheel nerf bar covers the entire area between the front and rear wheels. Besides that, there are two steps on each bar, one under the front door and one under the back door. Cab length option starts from the front wheels and ends on the second door of the vehicle. Bed access has the similar length as the wheel to wheel. It covers the entire distance between front and rear tires, but comes with an extra step, just above the bed access. Durable: There’s a 2 gauge tubing on the nerf bar which makes it strong enough to be unbreakable. Dimpled Step Plate: The step plate on each step has amazing traction and serves as an anti-slip material even when stepped on with wet shoes. This nerf bar is a popular one among Toyota 4runners for its 465 weight bearing capacity and variety of finish and lengths that it comes in. 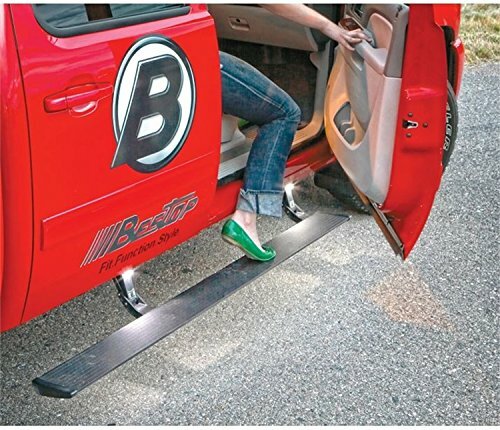 This is the era of technology and if you wanting something modern for your ride then the Bestop Electric Running Board can be a good choice for you. Unlike conventional running boards, it works on electrical signals and extends downwards once you open the door. Stealthy: Some drivers may find it frustrating to install a nerf bar because it is visible on both sides. Guess what? This running board hides underneath when the doors are closed and lowers 6” down and 2” out automatically when the door is opened. This one comes with sensors that are quite reliable. Superior Weight Capacity: The maximum weight this electrical board can withstand is 600 pounds. Anti-Pinch Safety: This feature is meant to experience pressure and prevent it from retracting on your feet. Quality Build: The board is a 6 ¼ inch wide high-grade aluminium that can handle harsh climatic conditions. Plus, it comes with an OEM quality sealed motor and heavy duty wiring to make it last longer. Accessories: You get LED lights and a controller as well with the product. So, if you’re looking for something that’s no less than a style statement and gives your vehicle a modern touch then this Bestop electric running board is for you. The AMP Research Powerstep works on an electric motor that makes the board extend and retract depending upon door activity. It automatically extends when someone opens the door and retracts when it is closed. It is quite durable and comes with integrated LED lights to make your vehicle look dashing. Corrosion Proof: The problem with electrical boards is that they might catch corrosion and waste your money. This is not the case with the AMP Research Powerstep because it is corrosion proof and never discolors. No Maintenance Required: The entire body is a combination of die cast aluminium alloy and stainless steel pivot pins. The aluminium body is coated and anodized with high grade material while the stainless steel pivot pins keep it in good shape no matter how much wear and tear it sustains. Weight Capacity: It can easily bear 600 pounds of weight. It’s a good investment because of its amazing features. Nothing beats the durability that steel brings to the table. This step bar is meant to last longer than most similar products while offering great ease. It’s very easy to install and doesn’t require any expertise. Strength: There’s a 3 steel tubing on the step area which gives it a lustrous shine and an unbreakable body. Resistant: The step pad is covered with the molded polymer that protects it from UV rays and also prevents rust from accumulating on the step bar. The combination of hard rigid steel and polymer makes is unbreakable, uncrackable and even protects it from fading. 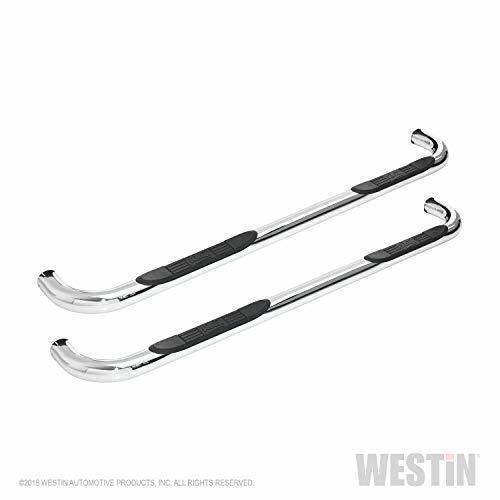 Chrome Finish: The chrome finish on the body makes it a chic looking step bar that enhances the beauty of your vehicle and also keeps it in good shape for years to come. Easy To Install: No drilling is required to set up this step bar. You only have to install the bolts and you’re good to go. Other than that, there’s also a 3 year warranty on the product. This is good step bar for people who are looking for durable step bars that also add shine to their cars and improve their look. Running Boards: The borderline difference between nerf bars and running boards is defined by the size and shape or both. When it comes to running boards, they are flat and have a rectangular shape. They can be wider with a width between 4 to 7 inches. However, the good thing about running boards is that one can also place a custom order and have a running board made of their preferred size (even wider than 7 inches), design, material and color. There are a plethora of styles one can choose from. Some running boards have rounded edges that display a tubular look while some have flat edges. They are flat and extremely wide which makes them very comfortable to step on. Moreover, the grip on them is good which reduces the risk. Nerf Bars: While running boards are usually rectangular, nerf bars come in oval, round or tube like shapes. So, it won’t be wrong to say that nerf bars win when it comes to being available in multiple shapes. Their size depends upon the shape they have. For example, oval shaped nerf bars have a maximum size of 6 inches in diameter while the round ones have the least, 2 inches only. Other than the oval and round shape, there’s also a tube style nerf bar which is popular for its U shape design. Last but not least, the grip pads and stepping area are below the door so that passengers can have safe entry and exit the vehicle. Another difference among the nerf bars and running board is how they are installed. While they may look almost the same and function in the same way too, their way of installation is a bit different. No drilling is required when attaching nerf bars and running boards to modern vehicles because they are attached to the existing holes given in the car. The process is simple and it’s not mandatory to go to a mechanic to get it done. All you may need a set of socket wrench. However, if the model of your vehicle is old then you may need to drill holes first before attaching a nerf bar or running board. Some nerf bars and running boards come with electrical components such as lights etc. These are recommended to be installed by professionals because the safety can be an issue in this case. Plus, they are also a little complicated to install. Things required to install include bolts, brackets and some other materials which are included in the box when you purchase a set of new nerf bar or a running board. Installing nerf bars and running boards is very easy and can be done by following the instructions manual. Running boards are fixed to the rocker panel weld area. Nerf bars are also installed in the same way but to the body mounted bolts. They can also be installed on the rocker panel weld area. It should be noted that they must be installed exactly how the instructions are given because the position mentioned is meant to give maximum support and incorrect installation may be risky cause injury. Same goes for running boards as well. The functionality of both nerf bars and running boards is the same, to help a person get in or out of a vehicle by stepping on it to minimize the climbing/reaching distance. In other words, consider them as ladders. They not only provide convenience but also improve the overall look of the vehicle. Choosing a winner out of them is a bit daunting because they are almost the same and have similar functions and benefits as well. The only major difference between two is their style. Speaking of style, nerf bars are more stylish because they come in a variety of shapes and materials as well. So, if you just want to add functionality to your vehicle then running boards are sufficient, however, if you also want to enhance the aesthetics of your vehicle then nerf bars are your best bet. But, as said earlier, it does the same thing! By now, you must have known that nerf bars have more of a practical use than an exterior upgrade. However, this doesn’t mean those aesthetics aren’t improved. The two most common types of nerf bars are wheel to wheel and cab length nerf bars. While they make it easier and safer to exit and enter the truck, they also offer an upgrade in terms of looks. Both of these nerf bars will fulfill your need, however, there are a few differences that one must know before making a purchase so that you can get one that fits your needs the best. Cab length nerf bars are also called sports bars because of their modern look. If you have a loading truck then installing a wheel to wheel nerf bar will help in loading and unloading goods in the cargo because it extends all the way up to the cargo unlike cab length nerf bars. Cab Length: These extend along the length of the cab and cover the front wheel all the way to the rear wheels of the vehicle. Both the sides of the vehicles are fully covered with a cab length bar and passengers from all the doors get to use the bar. As for their length, it is enough to provide a smooth experience when it comes to exiting and entering the vehicle from any door. Both the cab length and the wheel to wheel bar type offer good ground clearance and keep the debris and dirt at bay. Wheel to Wheel: They are almost the same as cab length bars but with an added benefit. Some of the wheel to wheel bars have a third step which gives an easier access to the utility racks behind the truck. Other than that, their length is enough to cover the area from front to rear wheels and is a perfect fit for work trucks, especially when the utility racks are in constant use. This design makes it easier to reach the bed as well and gain easy access to hard-to-reach items. 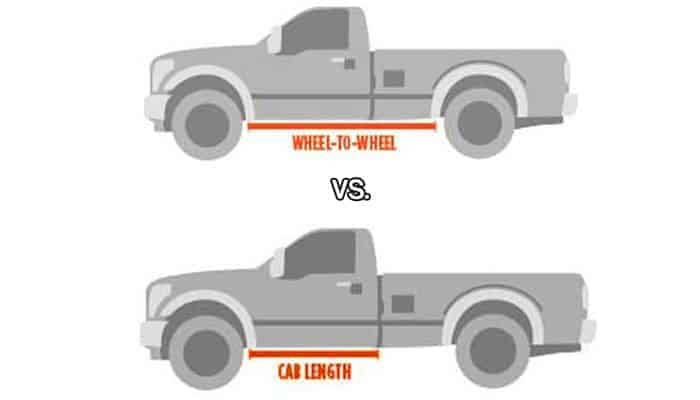 Taller trucks without running boards will cause the driver or passenger to go through a lot of struggle to get into the truck and come out of it. Another job of a running board is to the protect trucks from sustaining damage from dirt and debris. When the truck is operational and wheels are moving, the force of the wheel causes dirt, rocks and debris to be thrown at the door. This causes a lot of scratches and minor damage on the rear end of the door. However, with a running board in place, these external elements are restricted from causing such scratches. They also serve as doormats. When passengers or the driver enters into the truck, the dirt comes along with their feet and ruin the interior of the truck. But, when there’s a running board installed, the dirt from the shoe is captured by the running board and nothing passes inside the truck. Shorter passengers won’t be able to hop into a truck that’s tall. For example, kids cannot enter into a truck unless someone helps them out. A running board, however, this problem can be solved with the help of a running board. Nerf bars offer many benefits when installing on a truck. Firstly, they are more stylish than running boards and come in a variety of shapes and colors. The grip on them is tight and anti-slippery, hence, no slip and fall incidents can take place. Modern trucks of today are increasing in height with time. This makes it more difficult for passengers to get into the truck easily. Nerf bars act as a stepping medium to them and make it easier to climb on and get inside the truck without any hassle. Similarly, they also help in coming out of the truck. Outside elements such as dirt, debris and water can come into contact with the door and begin to accumulate on its ends. Thus, deteriorating the door’s structure. Having a nerf bar installed can prevent this from happening. Moreover, most of them are corrosion and rust proof, therefore, not only do they protect the door but also protect themselves from rust accumulation and discoloration. However, not all of the nerf bars on the market are rust and corrosion proof, therefore, make sure you buy one that has both the features. They are extremely durable as they come in a variety of materials. From steel to aluminium, every nerf bar is coated with a durable finish that withstands a lot of weight and remains firm in its place. Pickup Cab Length: The very first thing to look into a running board or a nerf bar is its length. Some drivers adore running boards that do not cover the complete length of a pickup while some other do. If you prefer to cover the entire length of your truck with a running board then we suggest you, to go for a wheel-to-wheel running board. It has a strong anti-slip grip and covers the entire length that stretches to the distance between the front wheel right up to the end wheel. Running boards come in two types normally. One, a full length running board and two, a running board in two sections. The one piece board is installed along the entire length of the vehicle while the two piece board is installed a bit differently. In case of two piece running boards, the first part is installed along the length of the vehicle and the second one is attached below the bed (depending upon if the bed configuration of the vehicle is short, medium or long). Style: If you want something more than just a step-on and weight supporter then nerf bars can help you. They serve the same functionality as the traditional running boards but are a lot more stylish. They come in a tubular metal material in addition to steel, and aluminium. You can choose round, oval or other shapes to give your ride a discrete and catchy look. The idea is to choose a shape that blends in well with the overall look of your pickup and enhances its appearance. Material: The material of the running board or the nerf bar is important. If your daily routine takes you to a dusty road every other day then going for stainless steel is a good choice as it is dirt resistant. There are other options available as well, including chrome finish, aluminium etc. Pick one that you find the most suitable based on your needs. Width: An average person may have no problem placing their foot on a board and climb easy, however, the same cannot be said for an overweight person. Here’s where the width factor comes into play. If you feel that you need a nerf bar that has a wider area for stepping then, by all means, choose one that has a wider area. This will prevent accidental falls when you’re in a hurry and will also help you step in and out firmly. These are some of the most common factors that one must consider when buying a nerf bar or a running board. It’s all up to your own preference, however, the stepping area and weight support must be highly considered. The material of a running board or nerf bar plays a vital role not only in the matter of endurance but in aesthetics too. Running boards come in a variety of materials. By now, we know that there isn’t much difference between nerf bars and running boards, however, the difference in materials is something that can’t be overlooked. Commonly, they are manufactured in aluminum and steel, but some other materials are also often used in the production of boards or bar. 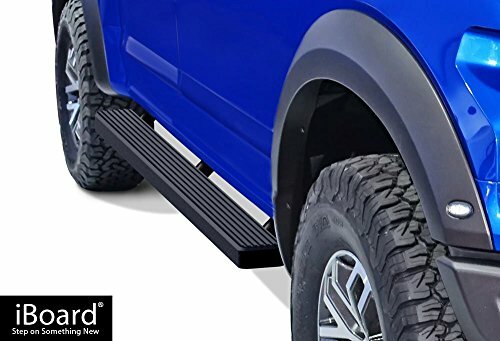 If your goal is to get a nerf bar or a running board that’s lightweight, sturdy and rust resistant, then aluminium running boards/nerf bars are your best bet. They may be found in older trucks but now, aluminium bars come in a variety of finishes such as diamond plate, black and brushed. Hence, they can be installed in modern trucks as well. Stainless steel requires no introduction as they are one of the strongest. 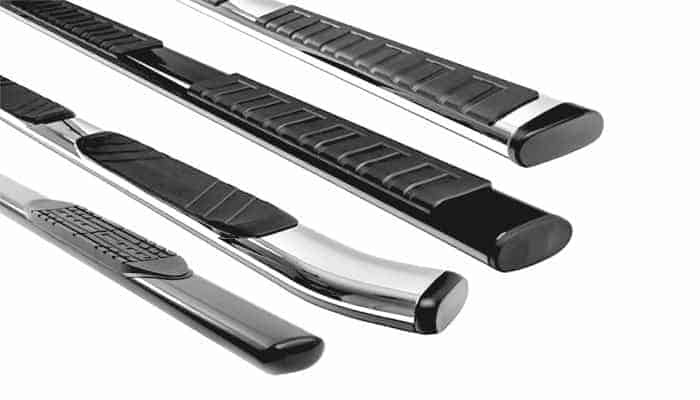 You can find steel running boards in a variety of finishes including polished stainless steel and black steel too. In terms of durability, they are one of the best and can also be opted in different shapes such as oval, round etc. If you are looking for a running board that’s cheap and durable too then ABS plastic boards fit the bill. They come in many styles including simple factory style board, eye-catching chrome railway board and more. They aren’t installed directly on the frame of the vehicle but have to be mounted on top of an aluminium frame. Obviously, there are other quality running boards or nerf bars out there, some of the best can cost into the thousands of dollars. For what we need to do as a regular user, the above options are the best to do what we need without breaking the bank. Side Step Nerf Bars or running boards have become a necessity for taller trucks because it is too embarrassing to be seen struggling trying to get into a truck. Plus, it is dangerous as well. Nerf bars and running boards are made to prevent such incidents. Whatever model you go with do you research and choose one wisely. I have to replace my truck step rails for ford 150. Non slip step works better than factory step rails. Do you have any suggestion? What is the best truck step rails ?